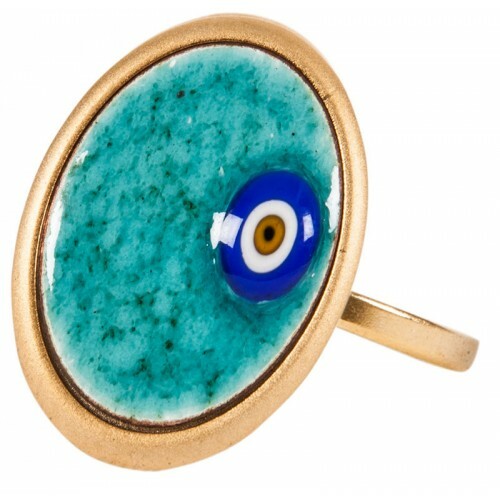 Turquoise evil eye enamel ring made on copper was designed and hand made by the artists of Atelye Turkuvaz. Material: Copper with a width of 0,65 - 1,5, 999,9 silver and enamel, black leather. The enamel consists of the combination of various oxides, glass dust, gold dust, platinum dust and various chemical substances. For each colour the product is heated in different ovens with a temperature of 790°- 970°C. Dimensions: S (10), diameter 3 cm. 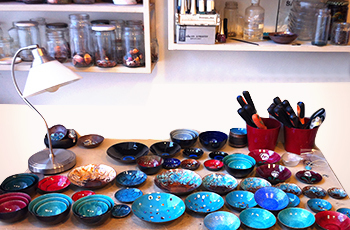 Atelier Turkuaz which was founded by Sibel İplikçioğlu and Şadan Çınar in 1987 and which makes enamel products; provides art works such as jewellery, painting, pot, plate, pen rack and box by using its own technique, along with the current methods. The workshop which made a significant contribution to the recognition of the enamel art in Turkey with the fairs it attended and its whole sales and retail activities is still the only workshop which makes production.